﻿National Day of Prayer: Calendar, History, Tweets, Facts, Quotes & Activities. National Day of Prayer is an annual holiday that serves to encourage Americans to pray, meditate and repent. It is also used to draw awareness to prayer and religious beliefs. The origins of National Day of Prayer date back to 1787, when Benjamin Franklin asked President George Washington to open each day with prayer, and to realize that prayer is deeply intertwined in the fabric of the United States. However, it was not until February 1952 during the Korean War that Reverend Billy Graham petitioned support of Representative Percy Priest to observe a national day of prayer. On April 17, 1952 President Harry Truman signed a bill proclaiming National Day of Prayer, to encourage Americans to turn to God in prayer and meditation. 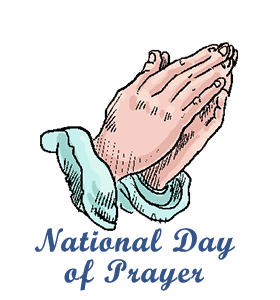 National Prayer Day is celebrated every year on the first Thursday of May. According to the Pew Research Center's Religious Landscape Study of 2015, 23% of Americans have indicated that they are not part of any religion. The survey is based on responses of more than 35,000 Americans. On October 3, 2008, The Freedom From Religion Foundation (FFRF) sued President George W. Bush and staff to challenge the designation of a National Day of Prayer. On April 14, 2011, the Seventh Circuit Court of Appeals ruled that the National Day of Prayer did not cause harm and a feeling of alienation cannot suffice as injury. According to the Pew Research Center, more than 55% of Americans pray every day. 60% of older Americans are likely to pray every day, compared to 45% of young Americans. Attend a religious service at your place of worship on the National Day of Prayer. If you are not religious, try meditation or meditative yoga. Offer a prayer for your loved ones and for those who are serving at the frontlines to protect America. Attend a spiritual retreat that appeals to your beliefs, including meditation and yoga retreats. Practice mindfulness by focusing upon the internal and external experience of each moment of life. Mindfulness creates awareness and encourages one to be grateful for their blessings. Attend a prayer event on Prayer Day. There are many local events, some religious based, others meditation oriented.